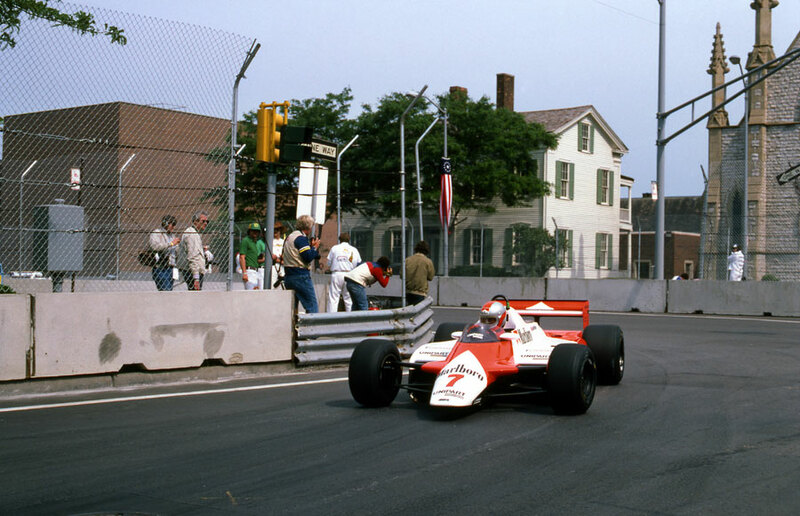 John Watson in a McLaren won the inaugural Detroit Grand Prix, his second victory of the season putting him top of the drivers' championship. His win also set a record for a street circuit as he started the race way back in 17th place on the grid. The new Detroit track in America had a troubled debut as practice started late when drivers complained about the bumps on the road. Despite former World Champion Jackie Stewart describing it as "an amazing race track" and "a glamorous way to run a motor race," the modern-day drivers with a better grasp on current Formula 1 looked at the track and shook their heads in despair. Concerns over bumps, tyre walls and a lack of run-off needed to be addressed before the drivers would go out for practice. "When it came time for the first practice session, workmen were still assembling sections of the guardrail and fencing," Watson said. "The extra practice planned for Thursday was cancelled, and the first qualifying session on Friday had to be postponed." Alain Prost took pole alongside Andrea de Cesaris, although Watson made the most impressive start to make up 12 places on the first lap. But on the seventh lap de Cesaris collided with Roberto Guerrero's Ensign - de Cesaris continued but the Ensign slid into a tyre wall, and then Riccardo Patrese locked his brakes and careered into the tyre wall right next to Guerrero. That caused the race to be red flagged. The delay was nearly an hour and when the race resumed the combined times of the two races were used to calculate the final places. Prost again led the field but Watson's charge continued and he took the lead from Keke Rosberg who, despite struggling with several mechanical issues, remained in contention until late on. "It's probably a little embarrassing for the team," admitted Watson, technically the No.2 driver behind Niki Lauda. "Niki wants to win very badly … still, it's too early in the season to be giving any thoughts to the world title." With an average speed of barely 80mph, the two-hour cut-off came into play. Behind Watson, American Eddie Cheever took second, the best finish of his 143-race career, with Didier Pironi in third. The general consensus was that the weekend had gone well, although Prost was not one to agree. "To have cars going over manhole covers is ridiculous."